Andhra Pradesh being the first State in our Country, to establish an exclusive organization, APSHCL, to promote and execute various housing schemes for the people especially to weaker sections and those who are affected by natural calamities.Our AP Chief Minister Sri. Nara Chandrababu Naidu has recently inaugurated AP NTR Housing Scheme to benefit the poor homeless families in the state. On 14-04 eve of 125th Birth Anniversary of Dr. B.R. Ambedkar. 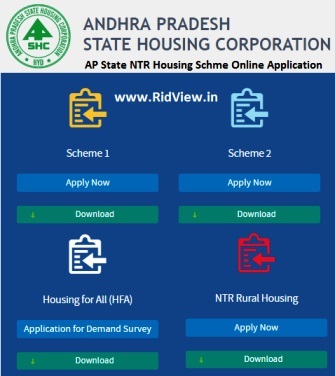 The AP NTR Housing Scheme Online Application registration forms are available for download on the website http://45.114.142.189:8788/apshcl/. For all the further details related on schemes and their implementations visit the official website. Citizens can also give your complaints in the website itself through special links provided there. They can also check the status of their complaints online.